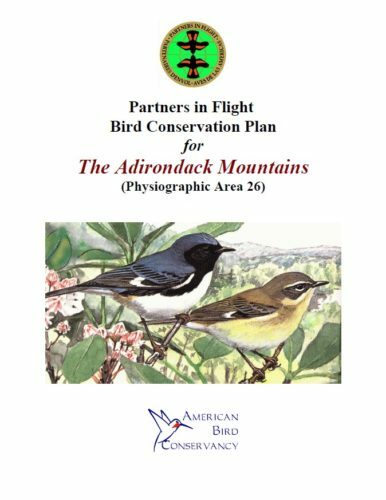 The Adirondack Mountains constitutes the smallest physiographic area in North America, with a total area under consideration of roughly 25,419 square kilometers. Landforms within the planning unit include high Appalachian peaks (1,000 m to 1,620 m), as well as a broad zone of lower mountains and foothills ranging down to 120 m [?] in elevation. Roughly 90 (?) peaks surpass 1000 m, with roughly 28,400 ha of forest occurring above that elevation. Most of the region consists of an ancient dome of Precambrian rock, similar geologically to the Canadian Shield. The physiographic area also includes the Tug Hill Upland, a hilly plateau (180 m – 600 m) that is more similar geologically to the Allegheny Plateau than to the Adirondacks. Highlands within this area constitute the headwaters of the Hudson River (including Mohawk River) and part of the St. Lawrence River (including Black River and Lake Champlain) drainages. The planning unit also contains thousands of glacial lake and pond systems, as well as numerous peatlands and springs. Roughly 336,000 ha of wetlands have been identified in the Adirondacks, with an additional 21,500 ha in the Tug Hill region.